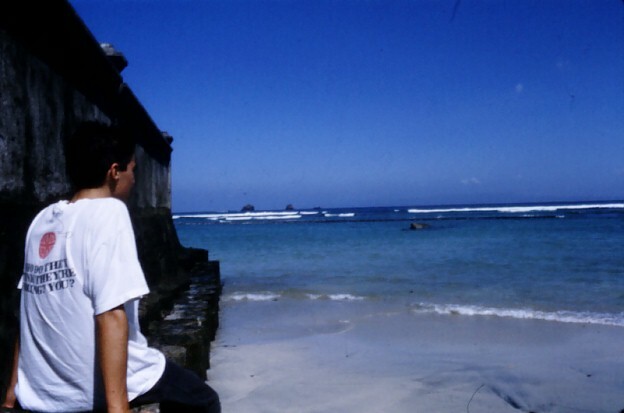 Finally we reached the coast at the village of Candi Dasa. It was great to see the ocean again. 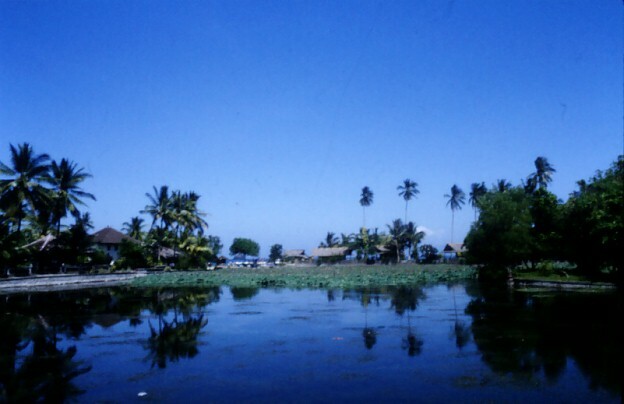 Candi Dasa has turned into a bit of a tourist spot, but still retains a lot of charm. We stopped for lunch (tuna and rice) at a little cafe by the beach. 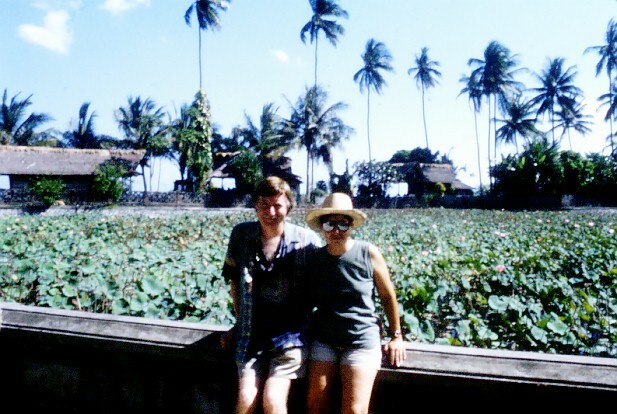 Perhaps the most well-known feature of Candi Dasa is its freshwater lagoon, filled with lotus plants, just across from the beach. This is Astrid and me by the lagoon. 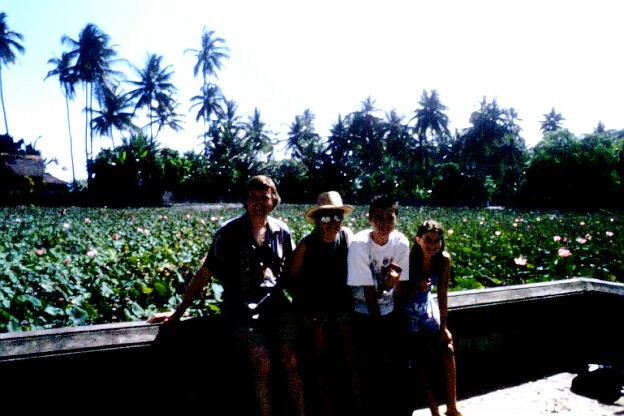 This is the whole family by the lagoon - me, Astrid, Dan and Julia. Some passing boys took our picture for us. As usual we got talking with the boys, and they produced a photo of themselves that they wanted to swap for one of our photos. Here's their photo. I bet they never imagined it would end up on the Internet! 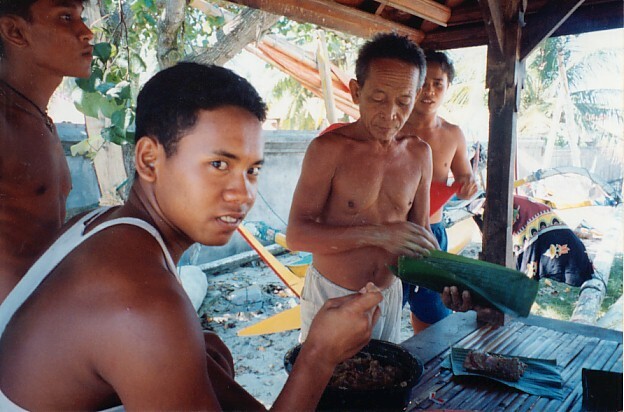 It looks like they are preparing food on banana leaves. Down on the beach these brightly painted fishing boats were pulled up on the shore. 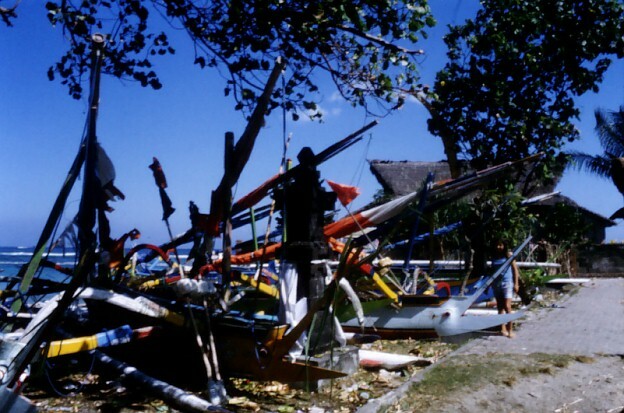 In the center of the picture is a shrine where they make offerings for a safe trip out to sea and a good catch of fish. Dan thought this beach was one of the most beautiful he'd ever seen. From time to time, women would come down to the beach and make offerings towards the sea. It was a beautiful place.